The hot water in Okushiobara is good for the neuralgia. 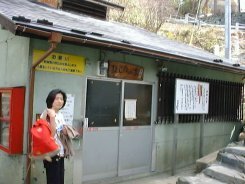 Mujina-no-yu is at a short distance from main street in Arayu Hot Spring town. There is Mujina-no-yu where you go down stone steps about 50 steps from Tera-no-yu. Mujina-no-yu is mixed bathing. You pay a fee to the box fixed to the entrance by yourself. This is a facility for the local people. It is said that this hot spring is good for the neuralgia. This is a true hot spring resort. There is an old hut in the rustic place. We smell the sulfur. There was a dressing room when we went through the entrance. Young/old men and women were soaking in the hot spring quietly. Hot water is white muddy. We have feeling that the water of Mujina-no-yu is softer than Naka-no-yu. Hot water temperature of the source is high at 59 degrees. Because it is very hot, we can not take a bath for a long time. As the water have much smell of the sulfur, we have feel that the smell and medicinal benefits of hot spring has been absorbed by our body. It is difficult to find the alley of stone steps for Mujina- no-yu. 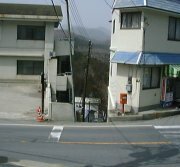 There is Tera-no-yu across the road. It's 6 km from Shiobara of Nichien toll road. There is Arayu Hot Spring town before the tollgate of Nichien toll road. There is the parking area near Tera-no-yu.